Highland Towers is a luxury waterfront condominium building standing 7 stories high between the Intracoastal and Atlantic Ocean in Highland Beach, Florida. All of the exquisite residences have beautiful views of the sparkling water, grand property, tropical landscaping, and neighboring cities. From two to 4 bedrooms, the Highland Towers Condos feature spacious floor plans, sliding glass doors, hurricane impact glass windows, gourmet kitchens, granite countertops, marble or wood flooring, walk in closets, custom lighting fixtures, covered balconies overlooking Florida’s sandy beaches. These upgraded features can be seen in many of the Highland Towers condos ranging in size from 1,300 square feet to 3,000 square feet. 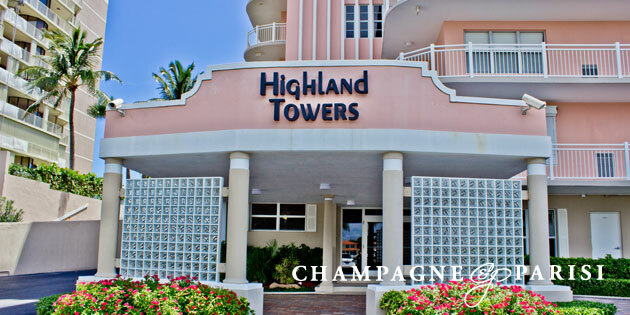 Highland Towers real estate offers resident grand amenities that are usually found in 5-star resorts. These amenities include a grand swimming pool, sundeck with lounge chairs and umbrellas with a view of the ocean, private beach, state of the art fitness center, and social room for entertaining. On the well-kept property of Highland Towers, residents will feel like they are on a tropical vacation every single day! If you live at the Highland Towers waterfront condo community in Highland Beach, you also have access to the many activities available in surrounding cities. Delray Beach and Boca Raton are just a short drive away and feature many shopping boutiques, fine dining establishments, entertainment, and so much more. There are no limitations for residents of Highland Towers which is located between two major international airports and nearby to major highways.